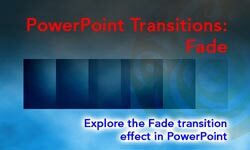 The Fade transition effect has been one of the oldest transitions available in PowerPoint. It is also the least distracting of all transitions, and most PowerPoint designers believe that this is one transition that's even better than no transition at all and works in all scenarios. What does the word "shape" mean to you? Do you imagine a square, a circle, a heart, or even a smiley face? Yes, all those are shapes -- as are the hundreds of other recognizable outlines or figures that we call shapes in our daily conversations. Shapes play a significant role within any slides you create for your PowerPoint presentation. In more ways that you may want to count, shapes are like the building blocks of almost anything you do on your PowerPoint slides -- PowerPoint 2016 provides hundreds of shapes efficiently categorized into 9 types. You can do so much with these shapes -- for example, you can combine shapes to create your own unique shapes, format shapes with fills, lines, and effects -- and even group or layer them to create more amazing graphics. You can even create flowcharts with these shapes. This tutorial explores the various types of shapes available within PowerPoint. Once you insert shapes on a slide, you may realize that it's not the perfect size -- did you want it larger, or a wee bit smaller? However you want your shapes resized, it's easy to make the size change in a jiffy, right inside PowerPoint 2016. Like most Microsoft Office programs, PowerPoint follows the concept of selection, then action -- so the first thing you need to do to a shape that you want to be resized is to select it! Any shape that is selected shows several handles. PowerPoint allows you to save your slides to many graphic file formats, which can later be used in other applications as required. One of the most popular graphic formats that you can export your slides to is PNG. This tutorial will show you how you can export slides to PNG, but using the same process; you can also export to other graphic file formats such as JPG, GIF, TIF, BMP, WMF, EMF, etc. Follow these steps to export some or all of your slides to a picture file format such as PNG in PowerPoint 2013. 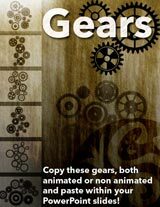 Use the ones you want -- either animated or non-animated or even both. To use them, all you need to do is copy them and paste in your own slide. What blogs do you follow regarding presentations?